A Superb piece of Jatukham Rammathep & Phra Pidta Pangpakan of Wat Phra Mahathat Woromaha Vihan, strongly blessed by Luang Phor Chai and Top Monks in a Grand Ceremony conducted at Wat Phra Mahathat Woromaha Vihan in BE2550. Featured stunning images of Colourful Jatukham Rammathep with Phra Pidta Pangpakan which is made from sacred Holy powder materials, herbs with Ceramic surface. Wat Phra Mahathat Woromaha Vihan is a First Class Royal temple in Nakhon Si Thammarat, south of Thailand. This temple is the Origin temple of Jatukham Rammathep and formerly known as Wat Phra Borommathat. 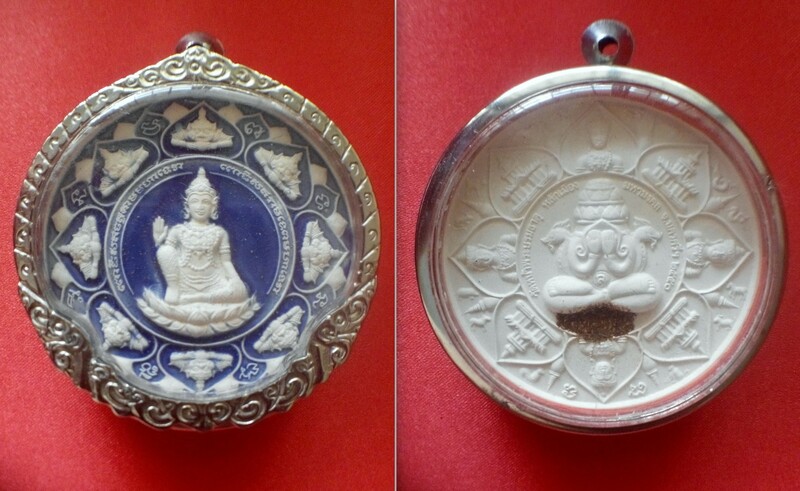 Material: Sacred Holy power with Ceramic surface and holy herb on Phra Pidta Pangpakan image at the back. Effect: Strong blessing in fortune, Protection from harm and danger, Smooth sailing in life, Overcome all obstacles in life, Good in business, opportunity and successful in everything you do. Grant wishes and helps achieve your aims. Highly collectible and 100% genuine with original temple box. Posted in JatukhamTagged JatukhamBookmark the permalink.